Google Home Mini vs. Amazon Echo Dot: Which is better? So you’re in the market for a low-cost smart home speaker, but you aren’t sure where to begin. While Google may have arrived late to the party with Google Home, the search giant is rapidly catching up with Amazon with a slew of feature upgrades, device integrations and new hardware packing its smart assistant. With good looks, great pricing and (almost) all the features available from its big brothers, the £49 Google Home Mini is perfectly positioned both as an entry-level gateway to the Google Assistant and supporting accessory for homes already equipped with Google Home. Of course, Amazon and Alexa are old hands at cute and compact smart assistants. Now on its 3rd generation, the £50 Echo Dot has been wowing Alexa-fans for years, and this latest upgrade in the device is a big one. Google Home Mini vs.
Amazon Echo Dot – which is best? We put the two devices side-by-side and ran them through the gauntlet (OK, not literally) to find out which device is better. It’s showdown time! While you could be forgiven for thinking that Google Home Mini and Amazon Echo Dot are similarly-priced devices offering similar specifications, a dig into the spec sheets reveals some important differences. Yes, these are both entry-level, compact, smart assistant controllers, but there’s nuances you should be aware of. With an array of seven far-field microphones, advanced Bluetooth audio support and, importantly, a 3.5mm audio jack, the Echo Dot is a low-cost Alexa controller. The 3rd generation of the device has greatly improved audio and sound quality over the previous Echo models. The Echo 3rd gen has a 1.6″ speaker, and you can connect the Echo Dot to a larger speaker if you want. You can also improve the sound on your Google Home by connecting a more powerful speaker through the Google Home app. In contrast, the Google Home Mini only has two far-field microphones for voice detection, but it does have a 1.57-inch driver. There’s Bluetooth support, but the device lacks an audio port. 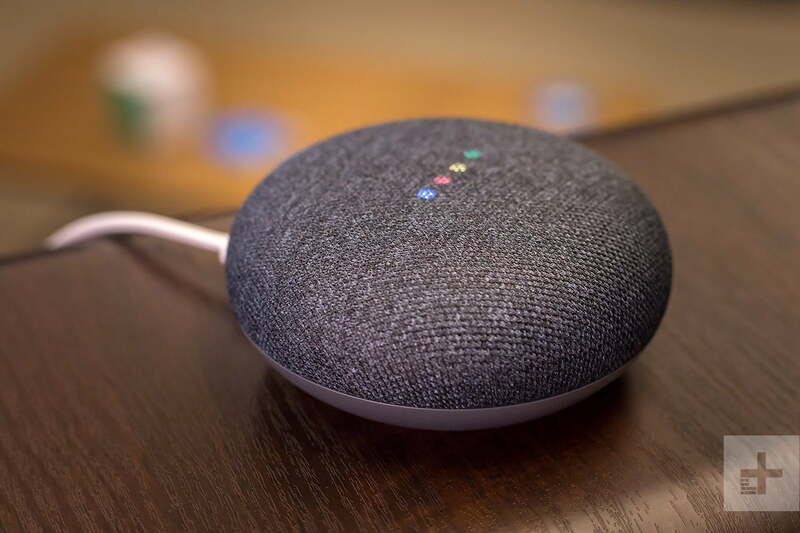 Integrated Chromecast and Chromecast Audio streaming and enhanced audio format support demonstrates Google’s belief that Home Mini can serve as a competent, if compact, standalone speaker – alongside other duties. Still, it doesn’t hold a candle to the sound upgrade made to the newest Echo Dot. When it comes to aesthetics, Amazon and Google have taken slightly different approaches. The Echo Dot very much resembles what you’d expect to happen if someone stomped on a regular Amazon Echo. The new and improved puck-shaped device now has a fabric cover and is larger than the older Dot. It has a build-quality that’s far more refined than you’d expect on a £50 device, and the compact size is unobtrusive in the home. The new Dot retains the iconic blue and orange LED status ring seen on its predeccesor. It adds a little interest, but also makes the Echo Dot more noticeable than you may wish. It’s more rounded at the top and bottom, and comes in charcoal, heather grey, or sandstone. While the Google Home suffered a more than a few barbs regarding its resemblance to a certain brand of air freshener, there was a clear attempt to visually differentiate the device from other tech in the home. Building on an experiment with the Google OnHub router, Google offers a range of textured covers for the device that allow home owners to better integrate the smart speaker with its surroundings. That mission continues with Google Home Mini, available in chalk, charcoal, aqua, and coral. Again, build quality is excellent and Home Mini’s pin cushion form factor gives the device its own identity. Google’s designers have even spent time crafting Home Mini’s circular power adapter, which fits neatly in the hand and protrudes from the wall far less than the Echo Dot’s power supply. There’s even clips on the power cable to tidy up any slack. These are small touches, yes, but they demonstrate a level of design detail and care that’s the hallmark of a great device. Amazon’s Echo Dot has been around much longer than Google Home Mini, so that’s given Amazon time to build out a relatively strong ecosystem. From calling features to routines to whisper mode (yeah, Alexa is about to get a whisper mode), Alexa seems to learn new stuff almost every day. Both devices can connect to and control a swathe of smart home stalwarts like the Nest Learning Thermostat, Philips Hue lighting, power outlets, smart locks and more. Google is working with partners to rapidly build out hardware integrations, but Amazon still has its nose in front. Alongside hardware connectivity, both devices can also access “skills” or “actions” that deliver enhanced features like news reports, recipes, reservation bookings, jokes, quizzes and more. Again, the Echo Dot leads here, with thousands of skills available for the device (some of which you may actually wish to use). Google’s offering is certainly smaller at this point, but is expanding quickly. Before jumping in with Amazon Echo or Google Home, be sure to review the streaming entertainment services you currently use. As per usual, Amazon very much sees Echo as a gateway to service subscriptions and heavily promotes Amazon Music over other options, although you will find support for Spotify Premium, Pandora, iHeartRadio, TuneIn Radio and Sirius XM. Apple Music or Google Play Music? Not so much. It’s a similar story with Google Home Mini, which has no problem helping you access music from online radio sources or Spotify’s free and premium services, but don’t expect support for Apple Music or Amazon Music any time soon. 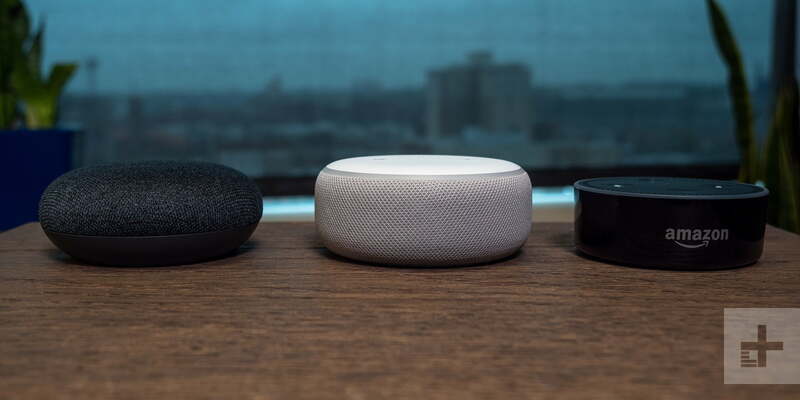 The new Echo Dot wrapped in sandstone sits next to the Google Home Mini and the previous generation of the Echo Dot. 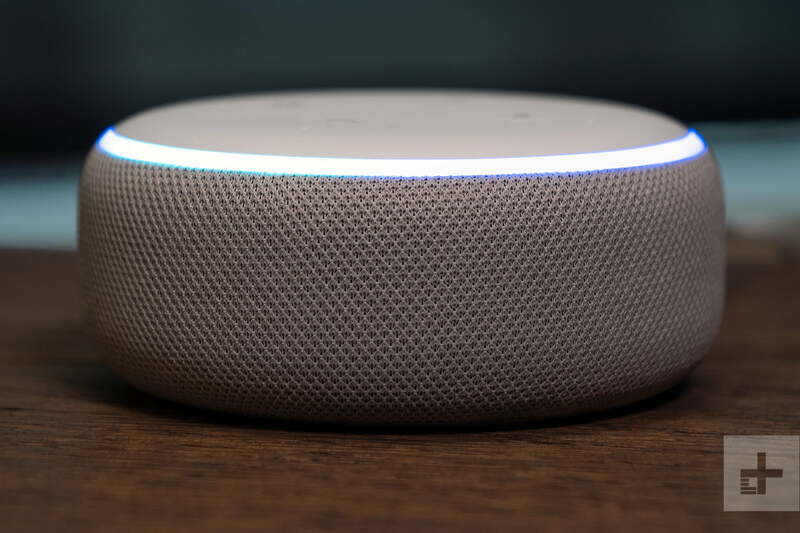 Rich Shibley/Digital Trends One thing to be aware of when purchasing either smart speaker is that both Amazon Alexa and the Google Assistant are in active development with perpetual changes. It means that both devices are regularly enhanced with new features, but you may also find that commands that worked previously no long work or might require a slightly nuanced voice instruction. Or, they might seemingly work for everyone else except for you. It can be a real frustration with both Amazon and Google services. That said, both devices work well at picking up voice commands, even when blaring out your tunes at full volume. 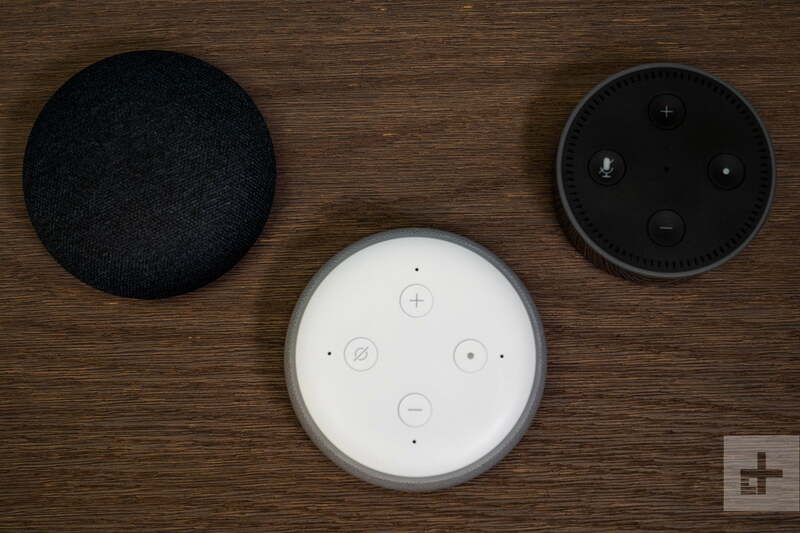 The Echo Dot’s design, with an overt LED status ring and physical buttons for volume, mic muting and triggering Alexa on the top of the device, give Amazon a slight edge on usability over Google Home Mini. The latter supports microphone muting via a rear switch and subtle, touch sensitive volume controls on either side of the device, all of which work well. While both devices support audio output, Amazon positions the Echo Dot more as a companion voice controller designed to be connected to a dedicated speaker like the Amazon Echo. The 3rd gen Echo has a larger driver and the sound is much better than before. Three-hundred-and-sixty-degree sound and a large driver in the Home Mini makes it a “smart speaker for any room” according to Google. But how do they stack up? Google Home Mini delivers louder audio with punchy bass. At full volume, the speaker manages to keep distortion in check, but there’s a lot of treble and it’s quite harsh. There’s little to no separation and the overall effect is muddy. You can use the equalizer to adjust the treble and bass; and sure, it’s a step up from your phone’s speakers (and the Echo Dot 2nd gen for that matter) but £50 won’t buy you a match for a decent, dedicated Bluetooth speaker. If this was between the 2nd gen Echo and the Mini, it would be no contest. The Home Mini wipes the floor with the Echo Dot 2nd gen in terms of sound. If you’re already invested in a smart assistant ecosystem, neither Amazon Echo Dot or Google Home Mini deliver compelling reasons to switch. Amazon should be celebrated for creating this compact, smart controller category with the original Amazon Echo Dot, which delivers much of the magic of it’s big brother(s) at a fraction of the price. And with the sound upgrades, it’s moved from simply being an entry level smart speaker that controls your home to an entry level smart speaker that controls your home and lights it up with sound. It’s clear that Google’s engineers and designers have spent time understanding and then building on the Echo Dot’s foundations. It looks better, and while it lacks the Echo Dot’s wealth of integrations, Google is catching up quickly. If you are a die hard Amazon customer, you’ll want an Echo Dot so it agrees with your existing devices (like Fire TV). However, if you don’t have Amazon or Google products, the decision becomes more difficult. If you do find yourself staring at the Amazon Echo Dot and Google Home Mini, wondering which one to take home, it’s Amazon’s newest Echo device that should win the day.